Continuous motion valve assembly at up to 750 parts per minute requires experience and competence. Our Assembly Machines are design for fast change-over and high efficiencies. We are able to handle springs that have been cleaned in citrus acid and crimp continuously using either a proprietary system or our own mechanical crimping mechanism. Transfer of components onto the main machine turret takes place using specially designed transfer wheels. Components are assembled at the entry point to the main Turret. 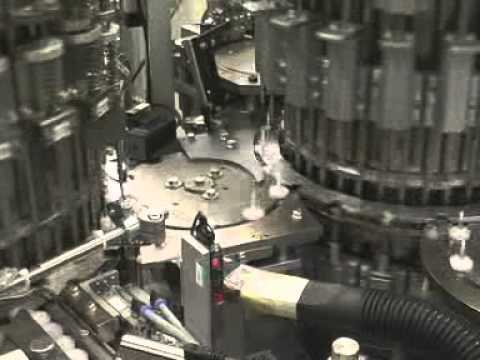 Locating pins on these wheels ensure that the incoming component is supported as it is assembled. Rubber Components at high speed are often fed using talcum powder. In the past we have been able to feed gasket and seals on a ceramic air track without the use of talc. 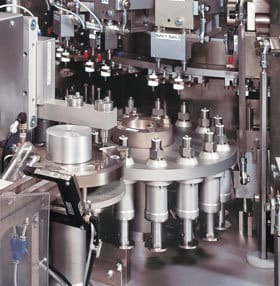 Rejecting Components at high speed in continuous motion is not an easy task to do. Our continuous motion valve assembly machines slow down to reject just the bad part, not the whole component. This minimises waste and improves overall efficiency. Whether small, stiff or elastic, we can build an assembly machine to assemble your product. 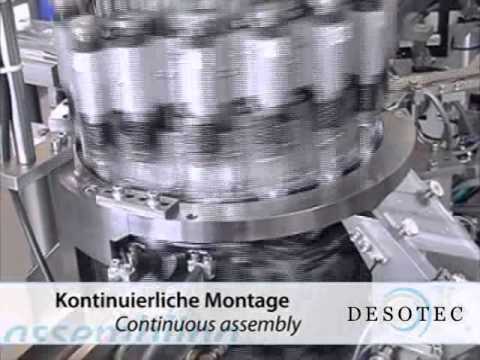 For increased flexibility our Assembly machines may use pucks for a fast changeover.